Photo by Mark McKenna Owner Tom Pagano at the Tomaso's Specialty Foods facility in Blue Lake. 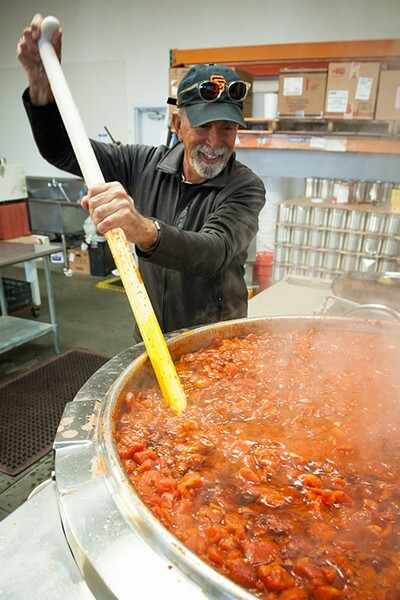 Photo by Mark McKenna Tom Pagano stirs a vat of Tomaso's basil garlic sauce shortly before it is bottled. 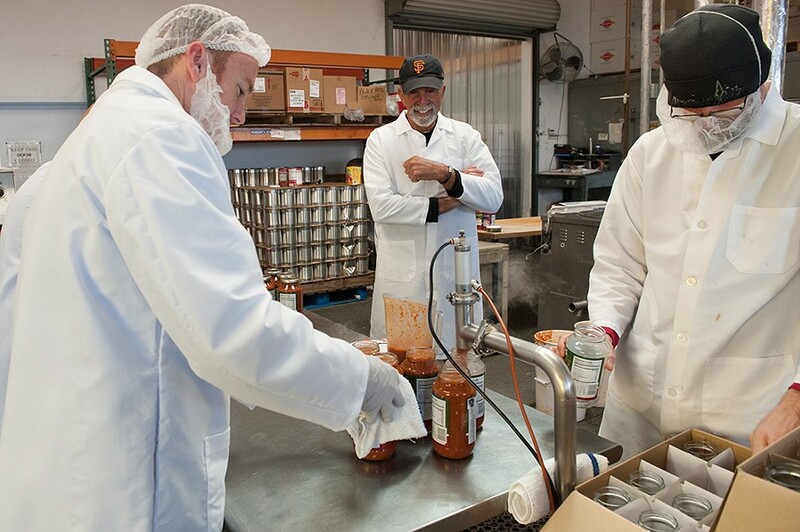 Photo by Mark McKenna Tom Pagano watches as Daniel Jones, left and Dave Scarbrough bottle jars of Tomaso's basil garlic sauce at the facility in Blue Lake. Photo by Mark McKenna A pneumatic filling device fills the jars with the exact amount by pushing a foot pedal. When it comes to cooking, Tom Pagano is a homerun hitter. He not only helped start Ramone's Café & Bakery and the Plaza Grill, he's also built a local food distribution empire that keeps dozens of food enterprises on shelves all over Humboldt County. But when it comes to finding a successor to own and operate the little empire that is Tomaso's Specialty Foods, well, Pagano's striking out. Dreams of retiring to play competitive senior-league softball are proving elusive. "I'm puzzled," Pagano says about the year-old for-sale sign in front of the Tomaso's facility in Blue Lake. "I just want to retire. The business is profitable. We're not having a problem." The New Jersey-born Pagano started solving culinary problems in 1972, when he opened Tomaso's Tomato Pies in Eureka. East Coast transplants needed their square pizzas and Pagano had a great recipe from his grandmother. In 1981, he helped Berit Meyer and Barbara Jewell open Ramone's Opera Alley Café, which later morphed into the area's most prolific local bakery-café chain. After a brief flirtation with the San Francisco culinary scene, Pagano returned to Humboldt in 1987 to head the kitchen at Plaza Grill. While he enjoyed running restaurants, his passion was sauce. Images of his grandmother stirring a thick marinara in mind, Pagano began canning 16-ounce jars off the stove in his apartment in Trinidad. Soon he was brewing cases in commercial cookers of temporarily closed restaurants. By 1993, Pagano was making and canning seven flavors of sauce, sticking on the labels and driving cases to stores and restaurants in his truck. 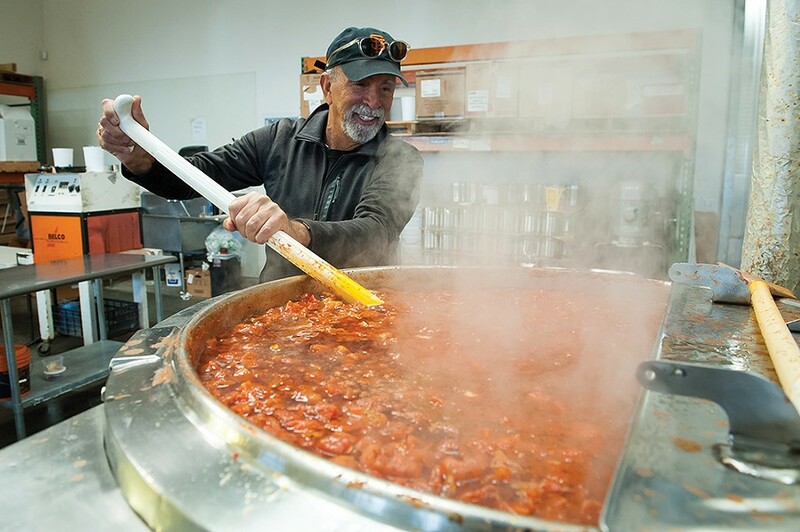 Tomaso's Specialty Foods and Distributing set up official shop in the city of Arcata's Foodworks incubator building and actually hired an employee. 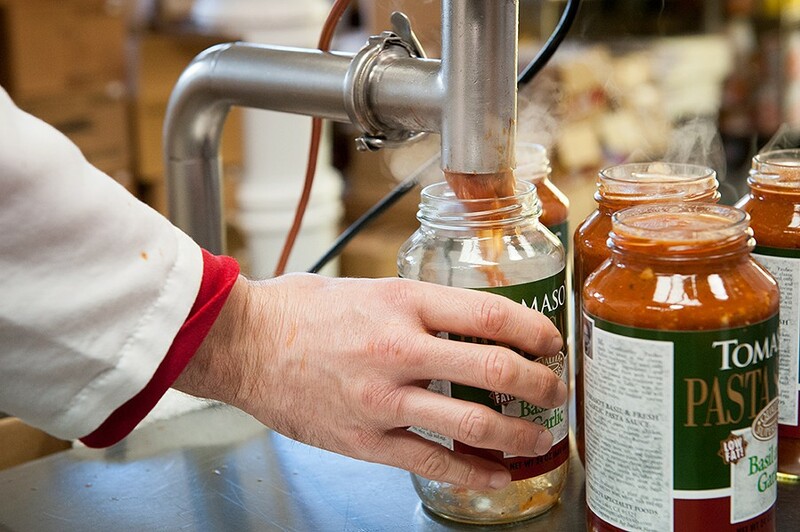 Pagano's third career — becoming the area's largest local-food distributor — grew organically from distributing Tomaso's brand sauces. Entrepreneurs at Foodworks were making salad dressings, frozen pizza and salsa. They needed to get their products in stores and Pagano was already driving his truck there. Larrupin sauces, Desserts on Us (including Lacey Cookies) and Zimmerman's jams went on the truck. Pagano acquired rights to Mas Salsa Por Favor, Weitchpec hot sauces, Lindah's Hot-N-Sweet Mustard and Smokey Jim's Barbecue Sauce. He struck co-packing production deals, making the products of fellow entrepreneurs Shamus T Bones and Smokin' Moses for a flat fee, then distributing them for another flat fee. The little empire moved into its own building in Blue Lake in 1998 and, two decades later, employs four food makers, two drivers and a manager to serve up dozens of products from Garberville to Crescent City. 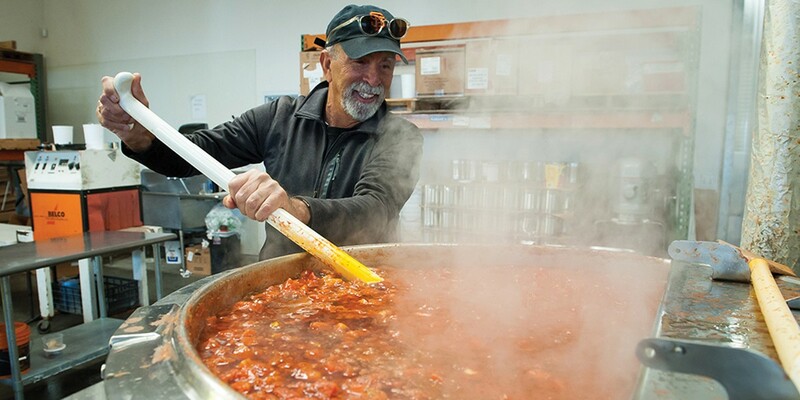 "Food made in Humboldt County is going to be a lot fresher than national brands," Pagano says. "Stuff from the big distributors was bought from a mechanized manufacturer, sits in a warehouse, then gets delivered. Plus, when you buy local products, the money stays here in Humboldt." Now in his 60s, Pagano is ready to take holidays in Italy and play centerfield on the road. He put Tomaso's up sale in late 2017 but, so far, hasn't received an offer he can't refuse. "Tom is pretty adamant about keeping Tomaso's in town," says Linda Disiere, the real estate broker Pagano retained to market the business. "Fifty to 60 people have inquired but a lot have been out-of-towners who want to move it out of the community." Disiere characterizes these prospects as investors, whose financial schemes usually include Pagano carrying a majority of the $499,000 sale price, to be paid over time, and even staying on as a paid employee. Pagano wants to cash out with a buyer who is willing to wear an apron. "The ideal buyer needs to be on site five days a week," he says. "You need a business person, but also someone who can make sure the products taste right." Early on, Pagano says, he offered the business to his manager and employees. Initial enthusiasm was curbed after visits to the Small Business Development Center and Redwood Capital Bank failed to produce sufficient financing. A half-million-dollar business opportunity is harder to finance than a half million house because there is usually no property to mortgage and few assets to secure one. Much of a business' value is the owner's ability to make a profit — often called "blue sky." Pagano will throw in his Blue Lake building for an additional $450,000. Disiere says two prospects are currently poring over Pagano's books and talking to banks. She insists the $499,000 price tag is fair for the $150,000 in equipment and enough sales to pay eight people. Pagano's just waiting for the right pitch. "It's Humboldt County," Pagano says with a wry smile. "There's a blockbuster movie opening at 8 p.m. and people show up at 10 minutes to eight." Editor's note: This post has been corrected to show the correct year for the founding of Ramone's Opera Alley Café, which was in 1981.